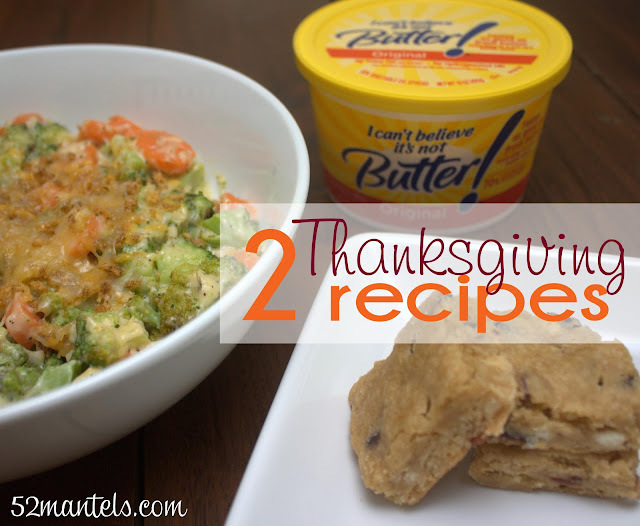 Today I've got TWO delicious Thanksgiving recipes to share with you, both using I Can't Believe It's Not Butter! instead of butter. Wouldn't Cheesy Broccoli & Carrots be a yummy addition to your Thanksgiving table? 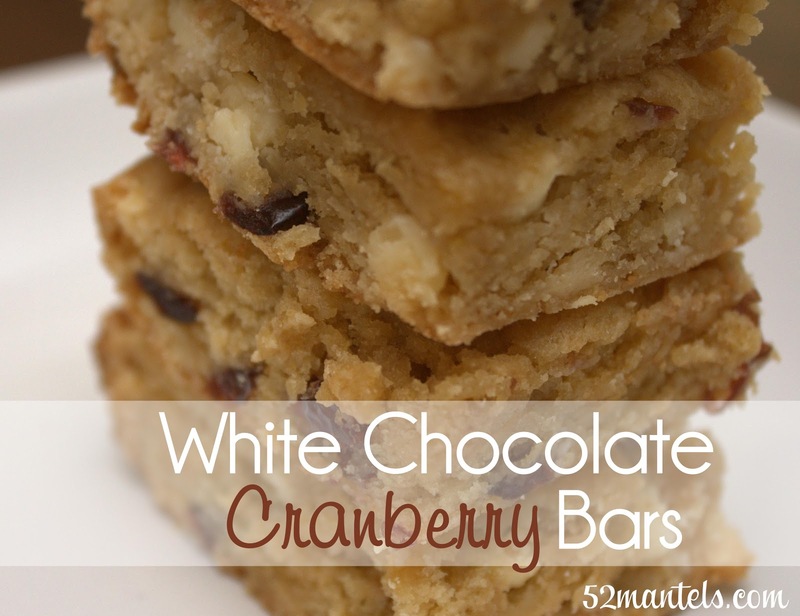 Wouldn't White Chocolate Cranberry Bars be a hit among your Thanksgiving dessert line-up? I sure think so! Both of these recipes pass my Thanksgiving side-dish criteria because they are 1) easy 2) delicious and 3) can be made ahead of time (that third one is key, folks!)! In a steam basket, steam carrots for 1 minute and then add broccoli and steam both for an additional 5 minutes. Remove from heat, drain and set aside. In a sauce pan, melt I Can't Believe It's Not Butter! Spread. Stir in flour, salt and pepper. Add milk and whisk constantly until thickened. Remove from heat and stir in 1/2 C. of shredded cheese until fully melted. 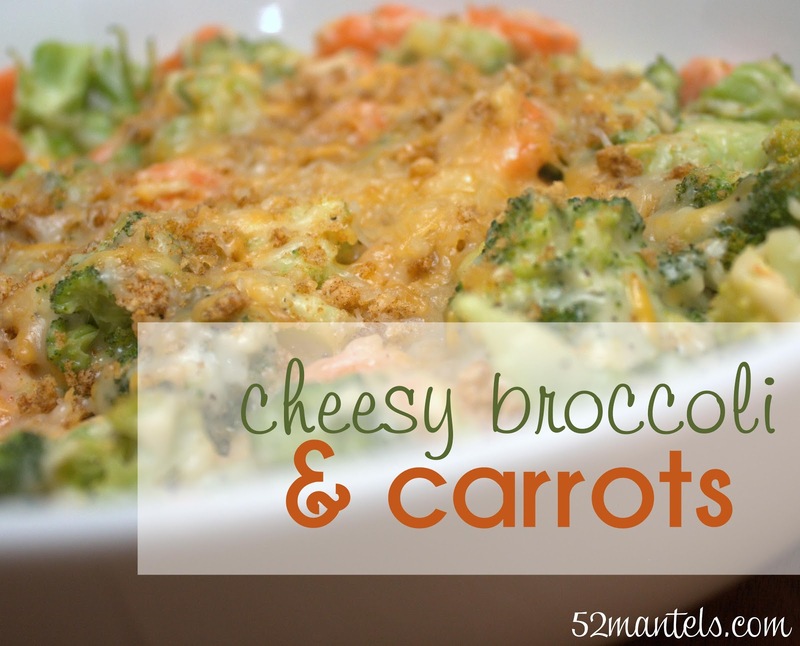 Place broccoli and carrots in a oven-safe serving dish and pour cheese sauce over them. Stir to combine. In a separate bowl, combine breadcrumbs with remaining shredded cheese. Sprinkle breadcrumb/cheese topping on veggies. Place in a preheated oven until cheese in melted and bubbly. Serve hot! 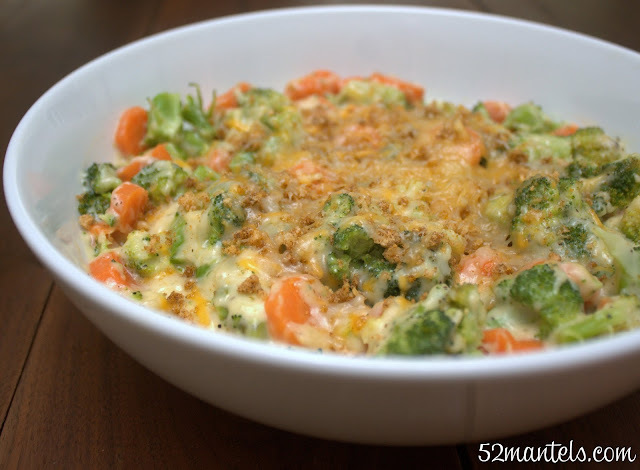 **To make this dish ahead of time, follow all steps until you get to the breadcrumb topping. Cover and refrigerate until ready to serve. To serve, remove from fridge, sprinkle with breadcrumb/cheese topping and bake until dish is hot throughout and cheese is melted. Of course, no Thanksgiving menu is complete without dessert! I love cranberries at Thanksgiving, but I prefer them on my dessert plate. Anyone else? This next recipe is the perfect amount of cranberry for my perfect Thanksgiving! In microwave, melt I Can't Believe It's Not Butter! Spread. Stir in brown sugar, eggs and vanilla. In a separate bowl, combine flour, baking powder and salt. Slowly stir dry ingredients into wet ingredients. 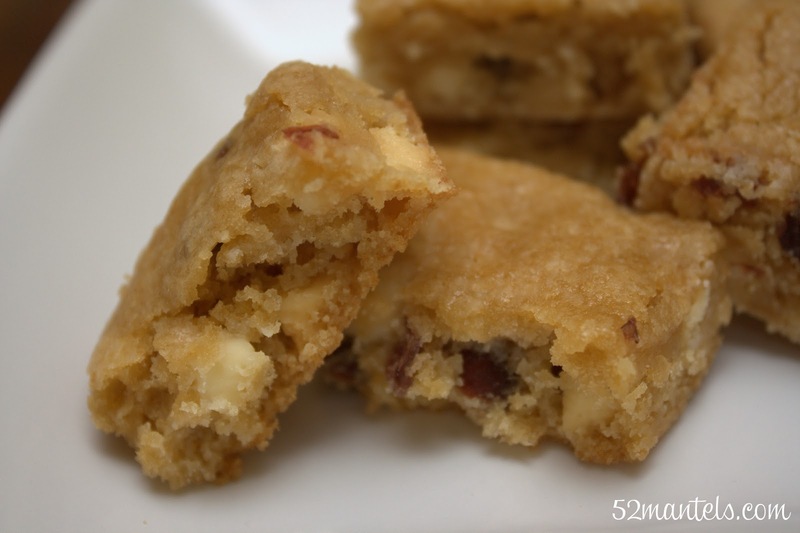 Fold in white chocolate chips and dried cranberries. 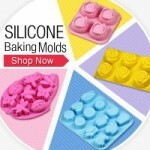 Spread batter into a greased 9x14" dish and bake in a 350 degree, preheated oven for 18-22 minutes. Bars are done when center is firm. Let bars cool completely and then cut into 24 pieces. Store in an airtight container. So, tell me, when it comes to your Thanksgiving menu, are you a sweet or a savory lover? Me? BOTH, of course! I'm making your broccoli dish tonight! It looks so good and I have everything for it! YUM! Those cranberry bars sound dee-lish! :-) Thanks for sharing with us! When it comes to my favorite Thanksgiving foods, I'm goin' with savory! And my favorite savory dish on that day would have to be STUFFING! The veggies sure do look good! Both look delicious!! Wondering if I could use Almond Flour for the cranberry bars?? Jill, I'm really not sure. I haven't ever baked with almond flour. It's worth a shot, though. This recipe is mostly pantry staples and doesn't require a ton of each ingredient, so it would be a good one to experiment with. Let me know how your experiment goes! These bars look so delicious! I need one! 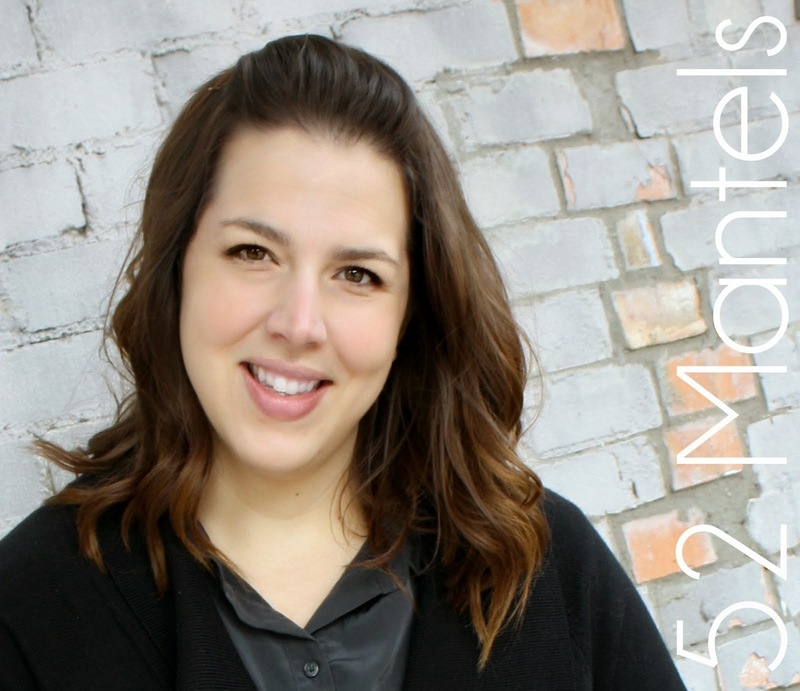 but all of them do not give a no fee cash advance payday uk this form of advance requires that you possess a permanent fulltime job with an account where your salary gets deposited monthly.